How often have you seen someone throw a circular saw around or break and not repair something like the blade-guard pawl? Have you ever seen someone continue to use a power tool with a badly torn up power cord and old tape dangling from the cord? Why throw away a tool that only needs a little oil, minor repair, or a new power cable? A little remedial cleaning and repair will allow a well-kept tool provide years of useful service. Power tools, especially name brands, are very expensive. You often see many people so intent on “getting the job done”, that they throw their tools around, or fail to make minor repairs. No wonder they get frustrated when the machine fails to function properly the next time they need to press it into service. One might only need apply a little oil to a circular saw to get the spring-loaded blade guard to close properly. Instead, they get aggravated and throw it into a box, bending the blade. Now it fails to cut, and often the tool gets the blame. Let’s point out just how dangerous it is to allow it to remain in use with a broken blade guard. Often, it takes no more than stopping for a minute and looking over the problem. Something that sticks can often be repaired by simply prying, making a slight bend with a screw-driver or better yet, a pry-bar. 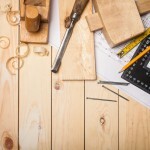 Incredibly, you might see a person who is capable of building a house, believing they can’t figure out how to replace something like a broke peg. They then continue to operate the machine, getting fingers way to close to the blade for comfort. The work is perhaps a 15 minute repair process, even if they fabricate the part themselves. A good rule-of-thumb is to simply take the time to look the problem mechanism over. Most fixes are very easy to do, and there is an additional reward of not having to go on a tool search, or to buy a new one, the next time you need to “get er done”. A saw may get very dangerous once the blade gets bent. It takes only a few seconds to straighten a bent blade, rather than throwing it into a box where someone else may attempt to use it. The teeth cut a certain width kerf (or slit), by design. If one or two teeth got bent out-of-place, simply strike it with a ball peen hammer against a solid surface until all the teeth look like they lean at the same angle. It’s surprisingly easy and usually works well afterwards. If your blade guard is the culprit, because of a sticking mechanism, take a few minutes, identify the problem, and fix it. If you decide it is beyond repair, for heaven’s sake, scrap it! Many power tools, such as a Sawzaw™, are designed for easy power cord replacement. Once they are beyond use, instead of throwing old power tools away, keep the old tool and later scavenge for the power cable or other parts. Why continue to use something that you know has a bad wiring insulator, or to just wrap it with a piece of tape, when you can replace the entire cord with a good one in just a few minutes on the bench. Many power tools, like hand-held grinders or drills, come with a new set of brushes. Put them away for later use when the box is first opened. Manufacturers design these tools for easy brush replacement to bring a formerly dead tool back to life. Some of these parts are available from local hardware stores, while others are easily found with a simple Internet search. This is especially true for name-brand tools. Practically every part available to a dealer is available from an online dealer and often for less than you could buy them from a local hardware store. Once you have the product number, you can often find the part available on eBay, and even offered with free shipping! The next time you feel like throwing one of your favorite tools out in the yard. just ask yourself: “Just how long would it take to fix this thing and get it working again?” How hard is that? 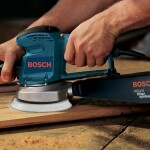 Random Orbit Sander or Orbital Finishing Sander: Which Is the Right Tool for Your Job?